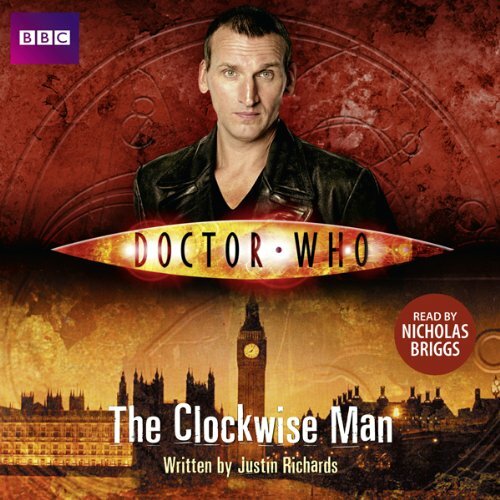 Read by Nicholas Briggs, The Clockwise Man features the Doctor and Rose, as played by Christopher Eccleston and Billie Piper in the hit series from BBC Television. easy to follow and I loved it very very much! plenty of praise for the reader! Nicholas Briggs brings the NInth Doctor to Life. If you could sum up Doctor Who: The Clockwise Man in three words, what would they be? 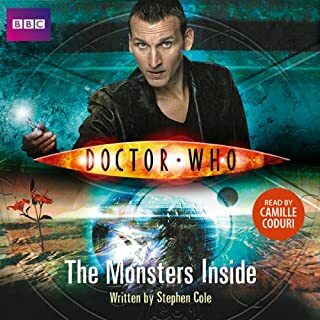 The Ninth Doctor is my favourite doctor and I was delighted to hear Nicholas Briggs bring him to life in this audiobook. 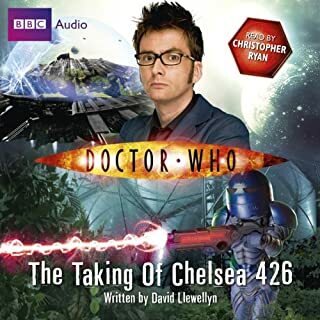 I completely forgot I wasn't listening to Christopher Ecclestone in the role because Nicholas Briggs' version is so perfect. The brilliant thing is that he is also excellent at the narrating (different voice) and doing all the other characters too. It was like listening to a multi-actor performance - only better. 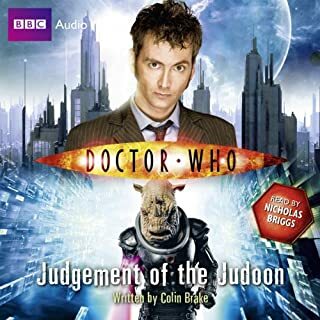 I wish there were more of Nicholas Briggs doing Ninth Doctor Who audiobooks. I have. I just wish there were more of him doing the Ninth Doctor. I would buy them all if there were. He is so good at this role. I wouldn't because Nicholas Briggs as the voices is what makes this so brilliant and that would be lost in a film. 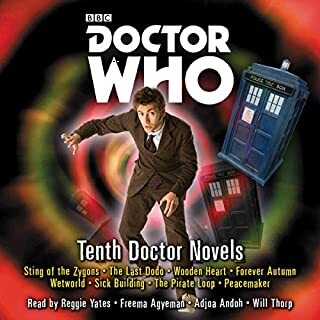 Please, please, please somebody employ Nicholas Briggs to do LOTS and LOTS of audiobooks as the Ninth Doctor - he is superb and there are probably many fans like me who would like to have more stories about the Ninth Doctor and this is the best way for us to have them. 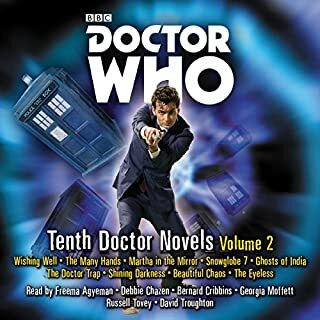 As with Prisoner of the Daleks, Nick Briggs superbly performs this book, his Ecclestone is surprising good, though perhaps not as good as his Tennant. The let down is the story, which somehow doesn't quite gel for me. It spends too much time being a pure historical with very little happening except a few mysteries to be solved that could almost be mundane in their explanation and doesn't hit the sci-fi element until mid-way through the story. This is to its detriment and only the end scenes in the clock tower sound like an episode of the television series, with Briggs' providing the tension by his reading. What is missing, however is some music to underline the tension. The best part of the story comes in the characters all well rounded and their switch from baddies to goodies (or vice versa) is well realised. Overall this feels a bit more like the BBC Past Doctors range than it does the first of the New Series Adventures, which is OK given that the author had very little to work on for characterisation. I'd recommend listening to this purely based on Briggs' performance of an average story. 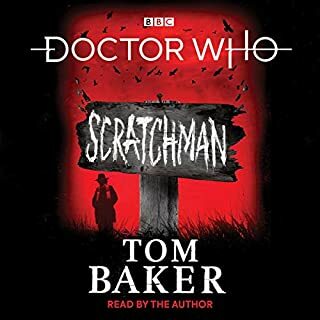 I have yet to listen to a Doctor Who audiobook that I didn't enjoy, and this one is no exception. 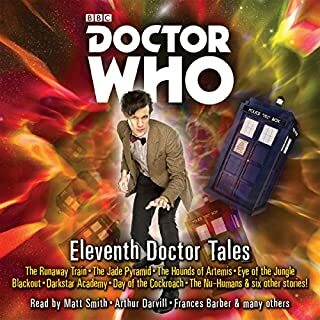 Nicholas Briggs, the king of funny voices, is as always an excellent narrator and brings each character to life in a way that seems effortless. 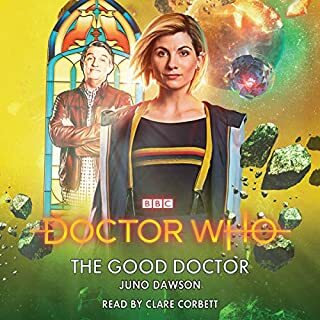 Definitely worth a listen, even if you're not a Doctor Who fan! Would you listen to Doctor Who: The Clockwise Man again? Why? I would probably not listen to "The Clockwise Man" again. I tend not to reread books, and I didn't find this story compelling enough to break that habit. The end was satisfying in that typical Doctor Who sort of way. Revelations were had, sacrifices were made, and the baddies were defeated. Nicholas Briggs has a very distinctive voice and he brings a lot of life to the story. He is clearly mimicking Christopher Eccleston's voice when he voices the Doctor, which is good for the most part, but sometimes comes off a bit odd. The second half of this book is great! It has tons of action and the foreshadowing and revelations are flawless. 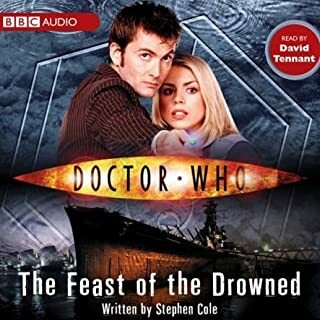 It was early days for the new series when this book was published and Rose's character doesn't feel as solid as it should be. Her thoughts and actions in the first half of the book could have been done by any teenager. She isn't quite the Rose we know and love in the TV show. Her characterization solidifies in the second half of the story. The first half of this book is slow, but the story needs the buildup for the ending to make sense. I enjoyed this so much. 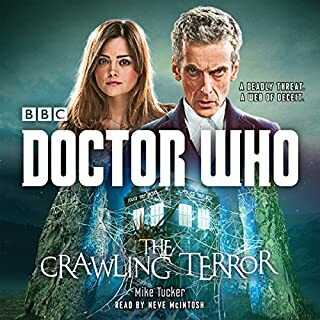 Nicholas Briggs is a fantastic narrator (some of my favourite Doctor who audio books are done by him) and he does Christopher Ecclestone so well. 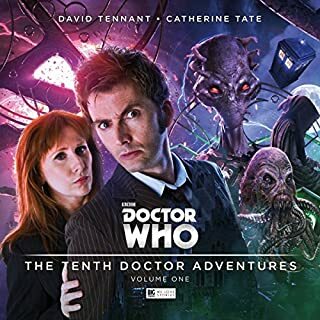 It was nice to have a 9th doctor audiobook. The story is really good- like a murder mystery. Nick Briggs does the best impersonation of the Ninth Doctor next to the Ninth Doctor. After awhile I forgot I wasn't actually watching it with Eccleston reading the lines. 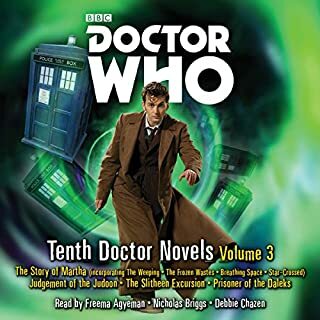 The story isn't bad either, classic Doctor Who-ness, though I'll admit I listen just before going to sleep at night, and I've listened to it twice and never caught much of the climax because I fell asleep both times. But I'll keep reading it until I do. I felt this story was okay. To be honest, it was probably a bit cerebral for me. The story is a twisty, turny mystery that takes up more than half the story laying out all the clues and back-story. From start to finish, the story began okay and then started to become convoluted. It seemed as if it tangled within its own web. There's lot going on in this story. From the main plot, to mistaken identity, royal scandal, persons of questionable mental capacities, and political skirmishes. Funnily enough, that's excluding all the extraterrestrial stuff. Another reason I had difficulty following the story was because of the large cast. There's a good amount of characters in this story and unfortunately, the narrator wasn't able to keep all the voices unique. Understandable though. Would've made a great episode and I probably would've benefited better if I'd read this book instead. With a lot of moving parts in a story, print tends to stay with me instead simply audio. 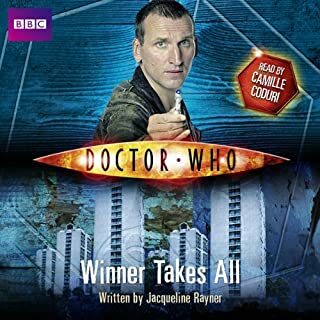 I went searching for a Doctor Who story narrated by the actor who played the ninth incarnation, Christopher Eccleston (to put alongside my David Tennant and Matt Smith stories). The narrator, Nicholas Briggs, was just as good, if not better. Don't get me wrong, at first, his Doctor voice sounded a bit like Bullwinkle with a northern British accent. But either it got better, or my ears got adjusted. 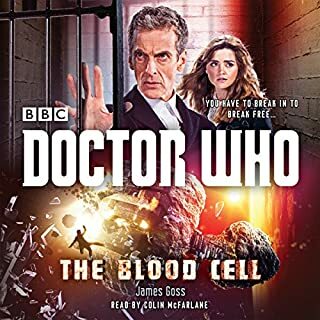 In any event, I was fully into this story because Mr. Briggs (voice of the Daleks and Cybermen, and head of the fabulous Big Finish line of audio productions) simply has a wide range of vocal talent. 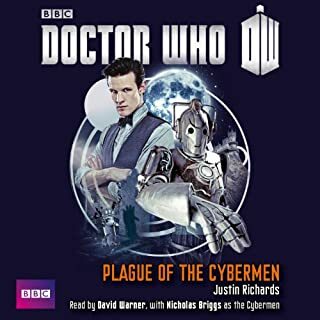 While the story was entertaining and had a number of good twists, the real enjoyment in listening was hearing it come alive through the many voices of Nicholas Briggs. One of the better Doctor Who novels I've come across so far. The narration, by Nicholas Briggs, was wonderful, he captures 9 perfectly!